With the snowy season fast approaching and with snow comes slush and dirt which can make a huge mess…wouldn’t it be nice to contain all the wet and mess to just one room? Mudrooms are a fabulous addition to any home. If you don’t have one you need one. If you have one, you probably need to update or re-organize it. Either way, today we are all about mudrooms!Every house has a rear entrance. It’s generally located off the kitchen or between the kitchen and the garage, and it’s the primary entrance the family uses. It often doubles as the laundry room. The bad thing is that it usually doesn’t get enough attention during your decorating process. For flooring, people choose only practical materials like linoleum or ceramic tiles to make floors there easy to clean. Walls are usually simply painted to cover the drywall. The mud room has long been a neglected space in the suburban home. The mudroom is the perfect place to organize and store footwear, athletic gear and outwear. 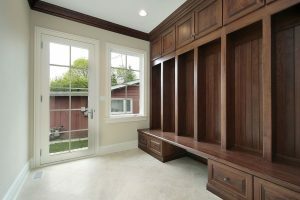 If you don’t currently have a mudroom but have a long hallway that’s connecting several rooms, it’s possible that this could be turned into a great mudroom. Furniture for mudrooms usually looks quite simple but is very functional. You will typically see a bench, some hooks, and shelves there. Cubbies or lockers are becoming more routine and are also more than welcome. If your mudroom doubles as a laundry room with sink, it’d be easy to throw dirty athletic clothes in them right away when you get home. In the next blog we will discuss the specifics of designing your mudroom. If you can’t wait until then and want to get started now on that mudroom, then call Andy onCall® and one of our Skilled craftsmen will help you start planning your dream mudroom today.